You might remember the story of old John Henry. He built rail lines, and could work harder and faster than any man alive. When the company brought in a steam-driven rail driving machine, though, they announced that they were going to fire all of the human rail workers. John Henry stepped up and challenged that machine. Challenged it, and beat it. And then dropped over dead. Keep that in mind as you read this. Roy Blount, Jr., the president of the Authors' Guild, wrote an editorial in the New York Times on February 25th, arguing that the text-to-speech feature of Amazon's new Kindle 2 electronic book reading device actually violates the intellectual property rights of the authors he represents, as it provides the functional equivalent of an audiobook, without paying for audiobook rights. The crux of Blount's argument is that it's critical to set a precedent now, because the text-to-speech is an audio performance of the book, and even if the digital vocalization is now lousy, it won't always be. Not surprisingly, authors who have more willingly entered the 21st century, such as Cory Doctorow, John Scalzi, Neil Gaiman, and Wil Wheaton, have attacked Blount's argument with gusto. Wil even provides an amusing side-by-side audio comparison (MP3) of himself and the Mac's "Alex" voice reading a section of his new book Sunken Treasure. My take on this? They're all wrong (well, probably not Cory)... and they're all right, too. That is, Blount is right about the technology, but wrong in his conclusions, while Scalzi/Gaiman/Wheaton/et al are wrong about the problem, but right about the proper response. The reason that Blount's wrong is that he's just trying to hold back the tide, fighting a battle that was lost long ago. The reason that the 21st century digital writers are wrong is that they've forgotten the Space Invaders rule: Aim at where your target will be, not at where it is. Text-to-speech is laughably bad now for reading books aloud. Text-to-speech could very well be the primary way people consume audiobooks within a decade. At present, text-to-speech systems that go from ASCII to audio follow a few pronunciation conventions, but otherwise have no way of interpreting what is read for proper emphasis. For the kinds of uses that current text-to-speech systems typically see, that's good enough. For reading books, especially fiction, that's not. It could have been told in detail how to emphasize certain words and phrases, probably through some kind of XML-based markup standard. Call it DRML, or Dramatic Reading Markup Language. Given the existence of other kinds of voice control systems (such as speech synthesis markup language and pronunciation lexicon specification), such a standard isn't hard to imagine. It would take some pre-processing of the text files, though, to really make it work. At the other end of the spectrum, it could actually understand what it's reading, and be able to provide emphasis based on what is going on in the story (basically, what you or I would do). Somewhere in the middle would be a system that had a number of standard emphasis heuristics, and is able to take a raw text file and, after a little just-in-time processing, offer an audio version that would by no means be as good as a real voice actor, but would, for most people, be good enough. The DRML version is possible now -- hell, I had DOS apps back in the 1990s that would let me add markers to a text file to tell primitive text-to-speech software how to read it. The "understand what it's reading" version, conversely, remains some time off; frankly, that's pretty close to a real AI, and if those are available for something as prosaic as an ebook reader, we have bigger disruptions to worry about. But the "emphasis heuristics" scenario strikes me as just on the edge of possible. There would have to be some level of demand -- such as would arguably be demonstrated by the success of the Kindle 2 and its offspring. More importantly, it would require a dedicated effort to create the necessary heuristics; amusingly, Blount's editorial has probably done more than anything else to make irritated geeks want to figure out how to do just that. It would probably also need a more powerful processor in the ebook reader; that's the kind of incentive that might make Intel want to underwrite the aforementioned irritated geeks. Ultimately, Blount's fears that a super text-to-speech system could undermine the market for professional audiobooks really have more to do with economic choices than technical ones. The requisite technologies are either here but expensive or just on the horizon, and the combination of technological pathways and legal precedent (as Doctorow describes) make the scenario of good-enough book reading systems all but certain. But that doesn't guarantee that the market for audio books goes away. The history of online music is illustrative here, I think: when the music companies were ignorant or stubborn, music sharing proliferated; when music companies finally figured out that it was smart to sell the music online at a low price, music sharing dropped off considerably. The more that the book industry tries to fight book-reading systems, the more likely it is that these systems (whether for Kindles, or iPhones, or Googlephones, or whatever) will start to crowd out commercial audiobooks. The more that the book industry sees this as an opportunity -- keeping audiobook prices low, for example, or maybe providing ebooks with DRML "hinting" for a dollar more than the plain ebook -- the more likely it is that book reading systems will be seen as a curiosity, not a competitor. None of these scenarios may be very heartening for authors, unfortunately. Sorry about that. At least you're not likely to keel over and die competing with an automated audiobook. 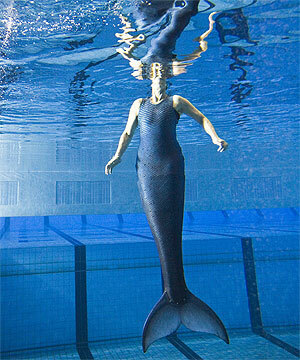  Cybermermaid: Nadya Vessey lost the lower parts of her legs, so she decided to become a mermaid. Much to her surprise, New Zealand special effects group Weta agreed to help her out. After seeing Ms Vessey test the tail in Kilbirnie pool then frolic in the harbour, Ms Williams was stoked. "It was absolutely amazing. It's beautiful to watch Nadya swim and to see that dream come true and to be a part of that. I feel quite blessed." The suit was made mostly of wetsuit fabric and plastic moulds, and was covered in a digitally printed sock. Mermaid-like scales were painted by hand. Mr Taylor said not only did the tail have to be functional, it was important it looked realistic. "What became apparent was that she actually physically wanted to look like a mermaid." Okay, not quite cybermermaid, but indicative of what will happen as prosthetic technologies continue to evolve. Not everyone who needs a prosthetic system will decide that they want to be "normal." Expect myth and legend to fill in the morphological blanks at first, but then more wild flights of imagination will take over.  H++: Issue #2 of h+, the futures-focused magazine produced by "Betterhumans" and edited by R.U. Sirius, is now available (Flash). I actually have a couple of articles in this one, both more environmental futurey than posthuman futurey. I can't link directly to them, because of the use of flash rather than real HTML/XML; when the copyright reverts to me in 90 days, I'll go ahead and repost them here. We're at the cusp of a massive transition, from the era of limited, subtractive energy resources to the era of unlimited, renewable energy. For a variety of reasons, we've long relied upon energy resources that have finite quantities, and once used, leave us stuck with (often deadly) waste products. These resources were easy to find and cheap to use, but -- from a long-term perspective -- were never really more than bootstrap technologies, allowing us to get to the point where we could shift to energy resources that are functionally limitless, and entirely renewable. That point is here. Hyperlocavore: "...a person who tries to eat as much food as locally as possible. Growing your own is as local as it gets!" Yardsharing: "... an arrangement between people to share skills and gardening resources in order to grow food as locally as possible!" These definitions (exclamation points included) come from the new social network "hyperlocavore," which blends bottom-up collaboration with food production. It's an example of peer-to-peer agriculture, and it's a pretty neat concept. Hyperlocavore just started, so you may not find yardsharing pals in your neighborhood -- so be the first. The founder of hyperlocavore wrote to me, saying that she thought this was a pretty "worldchanging" idea. I agree. Check 'em out. Carbon Manna Unlimited announced yesterday a cell phone-based Carbon Micro Credit system in the country that will allow residents to claim carbon offsets produced by using efficient cooking methods. Instead of using open-pit fires to burn biomass, families are encouraged to experiment with solar cookers and charcoal stoves. Basically, a switch to low-carbon cooking methods gets subsidized through the use of "carbon offsets" (the degree to which these would be considered actual carbon offsets, and the degree to which carbon credits work in the first place, are beside the point). Biomass cooking isn't a major source of greenhouse gases, but it doesn't help matters, and is both harmful to human health and harmful to the local environment. This is potentially a big win all around.  Second Death: As a friend to folks who do make use of Second Life for interesting projects, this story saddens me. As a futurist who grew tired of seeing Second Life held up as a Futurological Cliché, the story makes me relieved. In neither case, however, does the story leave me surprised. Mike Flynn of Opportunity Green attended the Art Center College summit, and took these shots of the three futures presented in my talk. Thanks, Mike! 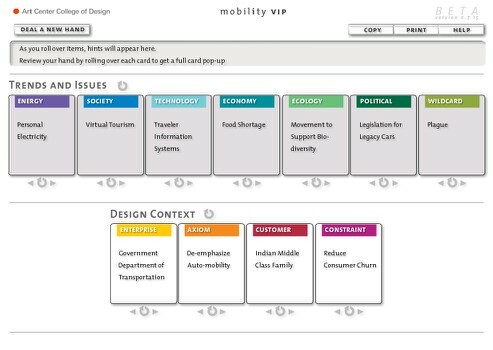 Also: very, very cool to discover the Mobility Vision Integration Process, a nifty way of quickly generating scenaric futures. The focus here is on mobility, but the process -- which Art Center College has chosen not to patent or otherwise restrict -- can be applied much more broadly. While the basic card version offers a fun way of playing scenario design (I so want to come up with the Collectible Card Game rules for it! ), the site also offers a Flash version that does a decent job of replicating the experience. What's particularly nice about the process is that it provides not just scenario bullet points, but the "design context" -- that is, the various constraints and demands that go into shaping the strategies operating in this scenario. 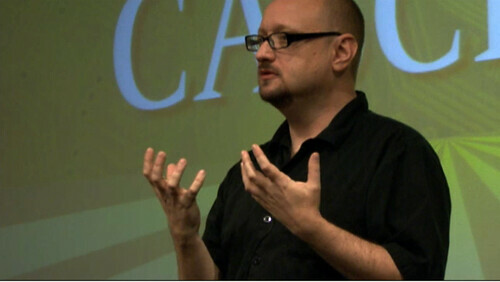 View more presentations from Jamais Cascio. This Thursday, I'll be delivering the morning keynote at the Art Center College of Design Sustainable Mobility Summit. My talk will cover the big picture context for the kinds of debates and discussions swirling around the event. There will be the usual assortment of drivers -- along with a cheeseburger or two -- but I thought I'd offer a preview of where the talk ends up. Bottom-up drivers enable greater collaboration and participation, but also greater instability. This is a future of Open Source Design and Global Guerillas. This is a world where power comes from the Commons. Technology-driven changes enable more sharing of information and ideas, but abandon the remnants of old intellectual property and privacy rules. This is a future of the Participatory Panopticon and Augmented Reality. This is a world where power comes from Relationships. Catastrophe and Opportunity combine to drive the creation of new economic, political, and social models. This is a future of Massive Disruptions and Unanticipated Consequences. This is a world where power comes from Creativity. To unpack this a bit: These are clearly not necessarily mutually-exclusive scenarios, but different ways of thinking about how anticipation, response, and resilience manifest in an era of crisis. By power, I don't mean it in the "...flows from the barrel of a gun" sense, but in the "social engine of change" sense -- that is, how we enable our anticipation, response, and resilience. Although I don't discuss a set timeline, I think of these scenarios as operating in the fifteen-to-twenty year horizon. I intentionally gave them all reasonably appealing names. I wanted to avoid any sense that I was pushing towards one or away from another, and especially wanted to avoid any intimation that this was a "good-medium-bad" set of linear scenarios. There's very little narrative to these futures -- so little that I actually hesitate to call them "scenarios" -- but they do provide structure. They're scaffolds, frameworks upon which to build stories of tomorrow. I have a fairly limited time to give my presentation, so I won't be able to do much building myself. My hope is that these three scaffolds will give the Summit participants a useful way of thinking about the various challenges and surprises they encounter at the event. As always, I look forward to seeing what kind of responses these ideas generate. Because "Bottomsight" just sounds too naughty.  Hot Cyborg Action: Industrial designer Hans Alexander Huseklepp wondered what would happen if you took the modern design aesthetic seen in simple prosthetics like eyeglasses, and applied it to more sophisticated prosthetics, like arms. The result appears to the right. Those of us who have worn glasses for quite some time know that the range of eyeglass styles available now are just orders of magnitude more interesting and appealing than those of a couple of decades ago. Modern glasses help to create an identity and make a fashion statement in ways that would have been simply unimaginable in the past. It's unlikely that there's enough of a customer base for fashion prosthetic limbs, but -- as I've noted in the past -- the application of modern technological and design principles to the world of adaptive systems can be revolutionary.  Massively Multiplayer Bank Robbery: A coordinated mass attack stole over $9 million from 130 automated teller machines in 49 cities around the world, including Hong Kong, Chicago, Montreal, and Moscow over the course of 30 minutes. Apparently it required a scam of a payroll service company that provided paycards usable in any ATM. While there are security camera photos of the people who actually hit the machines, they're generally considered to be "cashers," not the people behind the robbery. Let's see... mass-attack on a security flaw in a networked system? Sounds like the Griefer Future is rolling along nicely.  Mars Needs Rangers: New Scientist asks, Should Mars be treated like a wildlife preserve? My take: if life is found, definitely. No question. If fossilized life is found, also definitely, since that could mean dormant life, waiting for a Mars Spring. If there's no evidence of past or present life found... the question becomes more difficult. I always kind of sympathized with the Reds over the Greens in Kim Stanley Robinson's Mars trilogy, but I also believe that establishing a human foothold off of Earth is a wise long-term survival strategy. Could we justify changing the Martian climate, knowing that -- as with Earth -- such changes are irreversible? The robot is controlled by a neural network - software that mimics the brain's learning process. This comprises a set of interconnected processing nodes which can be trained to produce desired actions. [...] Finding the best combinations is not easy - so roboticists often use an evolutionary algorithm to "evolve" the optimal control system. 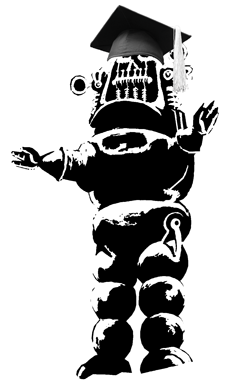 The EA randomly creates large numbers of control "genomes" for the robot. These behaviour patterns are tested in training sessions, and the most successful genomes are "bred" together to create still better versions - until the best control system is arrived at. MacLeod's team took this idea a step further, however, and developed an incremental evolutionary algorithm (IEA) capable of adding new parts to its robot brain over time. Nice. Look, if you don't want rampaging robots stealing your medicine, don't give them the capacity to alter their own brains! Sheesh. Just what we need. This may be the best talk I've given so far. I just watched it -- not having really given it any thought since the event last Fall -- and I was pleasantly surprised at how well it all came together. Basically, I took notes throughout the day, then got up in front of the crowd and spoke for 30 minutes, occasionally checking my note list to make sure I hit the issues that most leapt out at me. This entry is largely about the book process, and not about the content, so I'll rectify that problem. 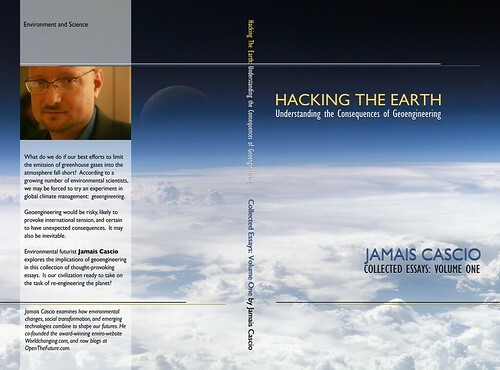 Hacking the Earth is a collection of essays written between 2005 and early 2009 on the subject of geoengineering, as well as our broader responsibility for the climate and environment. This isn't a science text; while science is discussed, it's written for non-scientists to be able to understand and make use of. Instead, Hacking the Earth is fundamentally a book about how our culture and politics would both influence and be influenced by the consideration and deployment of geoengineering techniques. Issues of control, responsibility, liability, and cultural perceptions of risk loom large. It's not a book that tells you whether geoengineering is bad or good -- it's a book intended to give some depth to the debates. It's a short work, only about 115 pages, easily read in one sitting. Hacking the Earth came out in early 2009, and in the subsequent time, I've written a number of additional pieces about geoengineering. Probably most important is a new essay on management of the process, "A Survival Guide to Geoengineering," published by the University of Minnesota's institute on the Environment. In February, I gave a talk on the same subject for the State of Green Business Forum entitled "Hacking the Earth without Voiding the Warranty"; a video can be found here. Today my collection of essays about geoengineering, Hacking the Earth, goes on sale. It gathers together the major pieces I've written about geoengineering, here and at Worldchanging; I've edited most of them to bring the content up to date, eliminate the bloggier aspects ("such and such just appeared at this link"), and give it a bit more flow. This is my "have to have a book in print" stake in the ground, at least for now. It's sometimes surprising how important a print publication still is in many knowledge and analysis fields. It doesn't matter if it's widely read, it just needs to exist. This is also an experiment in publish-on-demand. Rather than go through a traditional publisher, I'm trying out Lulu.com. This gives me a bit more control over the content, and allows me to put something about on a subject that probably won't be generating a lot of mainstream attention for another couple of years. If you decide to buy a copy, thank you. If not, thank you, too. I'm really curious about how well this model of book publishing works, in terms of both success and failure. I don't think I have any more geoengineering items lined up right now. Therefore, I declare Terraformingstock over for now. No matter what, we would have to continue with emission reductions, even if we don't work fast enough to escape serious problems. Carbon dioxide sticks around in the atmosphere for centuries; the more we add, even slowly, the longer the crisis will last. But we'd also have to decide on a more immediate strategy. The conventional response would be to focus on mitigation, building the kinds of projects needed to lessen the very worst impacts of global warming. Even in the best scenario, we'd still see disastrous events, and many deaths; in time, however, we'd learn how to deal with the new climate. Hopefully, we'd be able to do so before too many people died from heat waves, drought, opportunistic diseases, storms, resource wars, forced migration, and the like. But make no mistake: the mitigation scenario would still be catastrophic for many around the world. That's why the geoengineering option appeals to many: systems that cool the planet a bit over the short run could suppress many of the more disastrous effects of warming temperatures, even as we continue with emissions reductions. Geoengineering projects are generally within our current technological and financial capabilities, and most emulate well-known natural processes. The goal would be to give us time to make the social, political, economic and technological changes needed to stop building up greenhouse gases. If you've been reading my geoengineering essays over the years, this one won't come as a huge surprise. If you're still new to the subject, however, it's a decent summary of where my thinking is at this point. Our first commercial autopilot, the Arduino-compatible ArduPilot, has been released and our goal of taking an order or two of magnitude out of the cost of an autopilot has been achieved: it's $24.95! Combined with a RC plane, this makes it easy to build a complete UAV for less than $500, which is really kind of amazing. As exciting as that it is, it's also sobering to know that a technology that was just a few years ago the sole domain of the military is now within the reach of amateurs, so we spend a lot of time educating our community on FAA regulations and safe and responsible flying (always under 400 feet, stay within line of site, pilot always able to regain control). The person behind this is Chris "Long Tail" Anderson, who designed this along with his now 11-year-old kid. Global guerilla implications are kind of obvious; what I want to see are suggested uses for amateur science, environmental monitoring, or other tasks that don't end up involving high-explosives. Arduino -- inexpensive general-purpose computing platform, open-source in hardware specs and easily programmed with commonplace software tools. UAV -- Unmanned Aerial Vehicle, a pilotless drone flyer able to follow a path without real-time guidance from a human. This is about as close to getting it wrong as I could imagine. The message here? People don't matter. The first track is just Singularitarianism 101. The next seven cover technology-based industries -- the mix of "here's what you can invest in now!" with "here's something that we can imagine" still to be determined. The last one, on "Finance & Entrepreneurship," gives away the game with its introduction: "...how can we monetize this new knowledge of future technologies?" The only one that gives a glance at social forces? The catch-all on "Policy, Law & Ethics." Nice that they can fit all of those issues, which have consumed the human mind for millennia, into a single theme. Too bad they couldn't have found room for politics (which is not the same as policy), economics (sorry, finance isn't the same thing, either), demographics, history, cities and urban planning, trade and resources, or war, let alone art, media, psychology, or cultural studies, too. For an institution that claims to be "preparing humanity for accelerating technological change," it sure seems to be spending a lot more time talking about nifty gadgets than about the connection between technology and society. To put it another way: this is all about the symptoms of "accelerating technological change," and almost nothing about the consequences. For a trade show or a business workshop, that's fine. For something calling itself a university, it's amazingly short-sighted. Given the nature of the subject matter, that's especially ironic/tragic. With Ray K as the chancellor, you're not going to get away without a Singularity 101 session -- but this doesn't need to be a full track. Understanding biotech, radical longevity, and enhancement. Understanding energy, ecological systems, and nanotechnologies. Understanding neurotech, cognitive systems, and AI. Emphasizing the role that political choices have in shaping technology. How does scarcity manifest in an accelerating tech world? How do you deal with mass unemployment, technology diffusion, leapfrogging? Shifts in population and cultural identity; understanding impact of extending life. Understanding the changing nature of identity in a densely-linked world, looking at how different forms of identity clash. How does governance emerge? How are laws about technology shaped? How ethics emerges in a swiftly-changing environment; morality and technology; precautionary/proactionary principles. Open source, open access, open governance; understanding resilience. That is: three tracks on emerging techs, two tracks on political/economic impacts, two tracks on human/culture impacts, and three on the processes and institutions that grapple with large-scale change. These kinds of classes would be much harder to put together than "This Tech Will Change Everything! 101", but they'd be correspondingly much more powerful. A useful Singularity University (or whatever it would be called) would be one that dove deeply into the nature of disruption, how society and technology co-evolve, and how we deal with unintended and unanticipated results of our choices. As sorry as I am to say it -- there are some very good people, folks I admire and respect, who are on the faculty & advisor list -- this institution isn't what we need in an era of uncertainty, crisis, and potential transformation.  The Year Ahead, Sterling-style: Bruce Sterling and his European alternate identity Bruno Argento both present visions of what 2009 will hold in the latest edition of Seed magazine. 2009 will be a squalid year, a planetary hostage situation surpassing any mere financial crisis, where the invisible hand of the market, a good servant turned a homicidal master, periodically wanders through a miserable set of hand-tied, blindfolded, feebly struggling institutions, corporations, bureaucracies, professions, and academies, and briskly blows one's brains out for no sane reason. The year to come is best approached as a learning opportunity. It offers a golden chance to bury our dead prejudices and learn how to properly feed the living. Once we stop shaking all over and scolding Americans, we will recognize the tremendous potential this new century offers the people of the world. The sun still shines, the grass still grows, we are still human. If we stopped pretending to be puppets of an invisible hand, we would not fret over the loss of the 20th century's strings. We might see that life is sweet. The year ahead is not already set in stone. There are divergent forces at work, and we still have a role in shaping what kind of outcomes we see.  Press the Reset: Wired reports that NATO is looking for a simulation system able to model the "Political, Military, Economic, Social, Infrastructure and Information (PMESII) domains" in Afghanistan -- essentially, a SimAfghanistan. The Wired report has the usual assortment of skeptical and incredulous replies, with nobody really making the point that the goal of a sim like this shouldn't be to create a mirror Afghanistan, but to have a tool to uncover hidden interactions and unanticipated consequences of strategies. In short, a sim like this won't tell you what will happen, but could be useful for showing what might happen that you didn't expect to see.  The (News)Paperless Society: I had a chance to sit down with some independent press folks the other night to talk about the future of media, and their conclusions were grim. In this case, I'm something of a catastrophic optimist: I think that the global media, American in particular, will crater and come close to death, but that something wonderful will emerge from that crisis. One interesting data point along the way, indicative of both the fall and (potential) rise: tech economy insiders, looking at the numbers, now claim that for less than the New York Times pays in a year for print and distribution of its papers, it could give a Kindle electronic book reader to every one of its subscribers and quite a few of its newsstand readers. That's indicative of more how insane the costs are for print than how cheap e-book readers are; as Ars Technica's John Siracusa writes, we still haven't seen the e-book revolution, and are nowhere near seeing the technology's true impact and importance.  Mother Should I Build the Wall? The Gaia hypothesis argues that the Earth's systems are generally homeostatic, driving towards balance and avoidance of disruption. From that perspective, we're better off trying to minimize our footprints as much as possible, so as to allow natural processes to work as they should. As a model for behavior, it's lovely, inspiring, and quite possibly completely wrong. Paleontologist Peter Ward, who specializes in the study of mass extinction events, argues that the Earth's systems tend instead to drive towards catastrophe, with runaway processes repeatedly bringing the planet to the brink of total extinction. And here's the twist: life itself is one of the major drivers of planetary catastrophism. Not just humans, but all life, especially microbial life which has, over the past 4 billion years or so, repeatedly covered the planet with poisonous gases and altered the climate enough to cover the planet with ice. Ward calls his alternative model the "Medea hypothesis," after the character in the play by Euripedes who kills her own children as vengeance against their father. 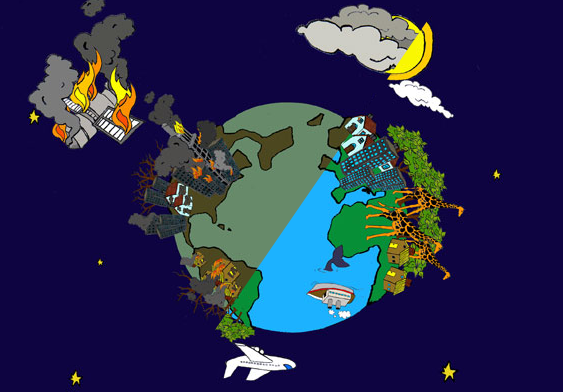 Rather than homeostasis, Ward argues that the Earth goes through boom-bust cycles, and that environmental feedbacks tend to make disruptions worse rather than bringing them back into balance. Although Ward admits that the full-blown Medea hypothesis is as exaggerated as the Gaia hypothesis -- and that Earth's history has both homeostatic and heterostatic processes -- he believes that the Medea perspective is an important, and under-represented, point of view. Ward is right to say that most environmental arguments are based on the belief that "leave nature alone and we'll be okay." But what if we're wrong? Geological history is filled with mass extinction events. Humans are causing a few of their own -- but we may be the first species in this planet's history able to prevent them, too.